The waters from the Dead Sea are unique in that they contain 27% of various salts as compared to 3% in normal sea water. The balance of the minerals are magnesium, potassium, calcium chloride and bromides. This is great as a natural exfoliant in salt bars and scrubs. Great for bath salts. The waters from the Dead Sea are unique in that they contain 27% of various salts as compared to 3% in normal sea water. Further, while sodium accounts for approximately 80% of the salt content of normal sea water, it comprises much less of the salt total in water from the Dead Sea. The balance of the salts in Dead Sea water are magnesium, potassium, calcium chloride and bromides. All Natural. COMMENTS: This stuff is great. I used this on melt and pour soap. It made it exfoliating but it was not harsh. Customers love this too. Great product. I would buy again. COMMENTS: I us it in balts salts and cold press soap. "A must have for salt scrubs!!!" COMMENTS: Blends really well in the WSP's foaming bath whip. Also hasn't clumped on Me yet. COMMENTS: I do like it very much, but I feel its the same as anywhere, I personally love dead seat salt but its a bit difficult to work with when I want to add it to anything, especially my bath bombs because salt attracts water and I fight with the humidity to keep my bath bombs from fizzing. Wonderful in a bath soak. "Pure and Pristine - always TOP QUALITY"
COMMENTS: I love the salts at WPS. The quality is always excellent; clean, pure salt that I am proud to use in my products. COMMENTS: Used in Bath Bombs and in Bath Tea Bags. Works awesome! COMMENTS: I am so in love with this sea salt!!!!! i have made a ton of scrubs and bath salt soaks with this base and am still left with a good amount. the feeling is great, and it absorbs color and fragrance well. i highly recommend this product and am so thankful i bought this!!!! COMMENTS: Customers love my goat milk soaps with dead sea salt added. Thank you. "Best,High Quality Dead Sea Salt I've Had"
COMMENTS: This is a great quality of dead sea salt. I have purchased from other sources over the years; however, I nearly immediately saw a difference within 2 days after testing it out in my personal bath water. I can tell that the minerals are rich and effective, as opposed to diluted. I plan on writing a post about it on my blog. YOU ALL ARE THE BEST SALT SUPPLIER! Thank you Whole Sale Supplies Plus! My best, Nerissa S.
COMMENTS: This is a good quality salt to use in your bath soaks. It works great. COMMENTS: I got these for my bath salts, I combined it with pink himalayan salts, and the results were amazing. I plan to order more in the future! COMMENTS: Great product! Love it in my bath bombs! Will buy again! COMMENTS: I love this Dead Sea Salt from Wholesale Supplies Plus. The fine grain texture is perfect for Bath Bombs and the price is great. I hope to use it in other products soon. Will always get my Dead Sea Salt here!! COMMENTS: I used this dead sea salt for my men body scrubs and so far so good! I combined it with coconut to cut the coarseness of it making sure it leaves the skin nice and soft! Worked perfect! COMMENTS: Use it for my bath salts. Great price and quality. 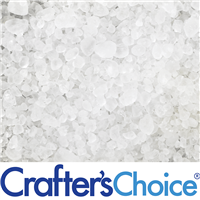 "Crafters Choice™ Dead Sea Salt - Fine Grain"
COMMENTS: I adore using this for my soaking salt line, I layer different salts into the jar along with herbs. This one is perfect to pour over the hers because it goes between the tiny pieces. Awesome when using lavender flowers. COMMENTS: The salt held the fragrance great and packaged in my jars with no clumping. My customers love it ! COMMENTS: Love that it is fine. Great for exfoliation. COMMENTS: These salts have a great size and texture, and melts very nicely. Mix with european and epsom, makes a wonderful product that holds color and fragrance well. COMMENTS: I use this in by body scrub, perfect size grain. Gentle but effective and I love the beneficial properties of dead sea salt. 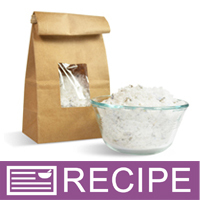 "Dead Sea Salt Fine Grain"
COMMENTS: Perfect for salt scrubs. Unless you prefer your salts to have little excess oil content, you need to ensure you add a sufficient amount of oil as too little will cause the salt to have a crumbled appearance. Otherwise, perfect! COMMENTS: I loved the feel this product gave to my bath fizzies, thanks! COMMENTS: Love the fine grain, just the right size for my bath salts and body scrubs. 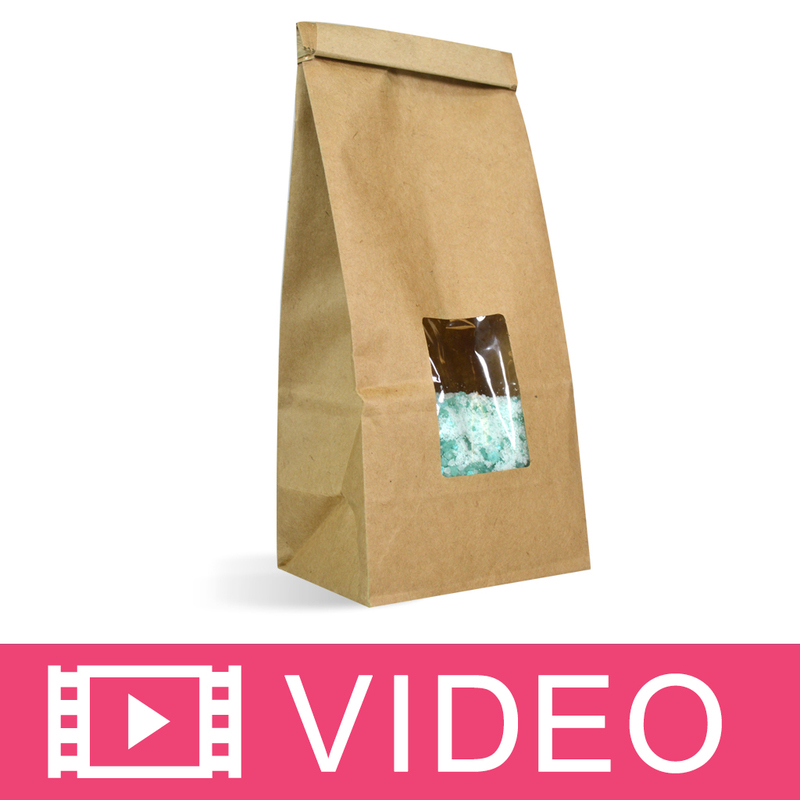 Customers love the added minerals that Dead Sea salts have to offer. "Great addition to bath salts"
COMMENTS: This fine salt makes a lovely bath salt when blended with other salts or alone. I recommend blending it because difference in grain size add dimension and depth. Feels great in the bath! COMMENTS: This salt is a nice fine grain and perfect for scrubs. COMMENTS: Bought 1 pound of this salt and I just cant get enough. It makes a great addition for the body scrubs. COMMENTS: I use this in my scrubs for added nourishing qualities. My customers love, love my scrubs. My best seller. "this salt is nice "
COMMENTS: Used this in a salt scrub. Very nice! COMMENTS: This is a good selection to add for salt scrubs. My skin came out feeling so polished which lasted several days. COMMENTS: The Dead Sea salt itself is nice, but not the best used for cold process soaps. COMMENTS: I used this in bath teas along with florals and Eo's or Fo's. It is doing a good job. No complaints here. COMMENTS: Customers love bath bombs made with this! Will be buying again! "Another good bath salt from WSP"
COMMENTS: Works great as a component of bath salt blends. COMMENTS: Great additive for summer soaps - I sell at flea markets, and people always purchase products with this in them. COMMENTS: WSPs Dead Sea Salts are second to none! Love the clarity and size of these crystals. Will buy these here from now on. Thanks WSP! COMMENTS: Nice product with a great texture. No large clumps. Easy to work with and has tons of benefits. COMMENTS: Beautiful salt...love the fine grain! COMMENTS: Love the fine grain of this product for my salt scrubs! My customers love the exfoliating properties without being too harsh. COMMENTS: I will be buying more soon. COMMENTS: Love the texture these salts add to my milk bath soak. Awesome product. COMMENTS: Very nice product! It is great for my bath salt recipe. Will keep ordering more! 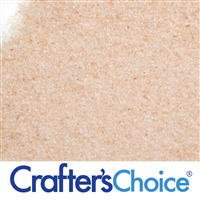 "Dead Sea Salt - Fine Grain"
COMMENTS: I really like this fine grain dead sea salt. It is consistently great without debris in it that I have found from other suppliers. It also is truly "fine". I have bought from other suppliers and it was much coarser. It makes my salt scrub have the nicest texture. I am very very pleased with it. COMMENTS: WSP has great quality products & that's why I continue to purchase everything I can from them. I have ordered dead sea salts from other companies but its is a better quality here. Will continue to purchase. COMMENTS: Exactly what I was looking for! COMMENTS: I love these. The small grain is perfect size for making bath soaks and adding to bath bombs. Not too large not too small. COMMENTS: I love the texture it adds to my scrubs. I am mixing it with dendritic salt and I am happy with the added texture and so are my clients. COMMENTS: I bought this for my bath salts. It is nice as people love dead sea salts. COMMENTS: Practicing salt scrubs and this one worked the best of what I tried. Liked it better than the Spa Salt. Althought it says "fine", I found it to need a bit more grinding to make it perfect for my scrubs. COMMENTS: Excellent grain for scrubs and soaks, not overly abrasive. I have sensitive skin so some products leave me feeling like my skin is stinging, this is just right. COMMENTS: I like this fine grain salt but, I wish the grains were just a little bit smaller. Overall still a great product. COMMENTS: Really happy with this purchase, nice grain for my scrubs and would work nicely alone or in a bath/foot soak. Customer get very excited they are from the Dead Sea due to the health benefits. COMMENTS: Just the right texture to adorn the top of the soap. Love this product. Good price, good quality. Wanting to make salt soap but haven't had the time - this will definitely be part of that mix! "Not sure if I trust it." COMMENTS: Dead sea salt is supposed to be very high in minerals and usually salt that's high in minerals has some color to it, this is very white. The price is good and if it says dead sea salt on the bag I'll call it dead sea salt on my labels, but I'm not convinced it's the real deal based on color and price. COMMENTS: I love this fine grind for making scrubs as it makes my scrubs not too abrasive and gentle for the face. "Great to make dead sea salt scrubs!" COMMENTS: I love using dead sea salt for scrubs, and the grains are just right to give a good cleaning of the skin. I have one customer with skin issues, and she uses the scrub and has commented that it is clearing up. I am glad that you offer this at such a great price! COMMENTS: Best texture for salt scrubs. COMMENTS: Like the fine grain in my bath fizzies. COMMENTS: The only company that I would trust when it comes to salt quality. I would never ever purchase from anybody else. COMMENTS: first time working with sea salts and product is exactly as advertised. Perfect size grain and it had a slight smell that was very nice. COMMENTS: I never did figure out why the dead sea salts are so terrific, but i know from years of use it does its job! I like the finer grains to blend into a hand scrub that i leave out in my bathroom for frequent use. My cuticles stay nice and hands soft. I also like the finer grain yo add to my botanical bath teas. Overall, joyful product to use! COMMENTS: This was exactly the grain I was looking for. Customers like the feeling of the products. They come out with extremely gentle exfoliating properties. COMMENTS: Dissolves quickly very therapeutic and relaxing with or without fragrances! I am encouraging friends & family to learn the luxury of the bath! COMMENTS: This is very good dead sea salt. COMMENTS: these are wonderful salts to add to your detox salt blend. I pair with essential oils and customers love them! "bath salts made simple "
COMMENTS: The salts were excellent for my bath salts. Easy to color and scent. I would buy this again. COMMENTS: Wonderful product and a great price. COMMENTS: I use these in a detox bath. Always feel amazing after a dead sea salt soak! 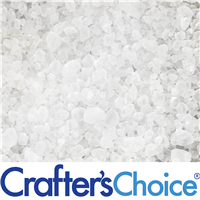 "Crafter Choice Dead Sea Salt - Fine Grain"
COMMENTS: Very fine and clean, perfect for scrubs. Flows well as long as it's kept tightly closed. COMMENTS: Wonderful for making bath salts and salt scrubs. COMMENTS: Holds scents well, feels great to bathe in, can't think of any negatives. COMMENTS: I use these salts in bath teas and my customers LOVE them! Fantastic product! COMMENTS: Makes a great salt scrub. COMMENTS: I use this salt for scrubs, especially foot scrubs. Dead sea salt properties are infinite and work great not just to exfoliate but also the minerals add a relaxing feeling to tired legs. COMMENTS: Thanks for a great product. Made salt scrub with this--perfect! COMMENTS: I use this in my bath salt blends. 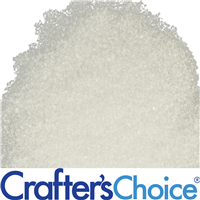 Melts quickly and is a great additive to other salts. COMMENTS: Dead Sea salt is so great for you and I love the fine grain, it makes it great to work with! COMMENTS: I mix this with pink himilayan Salt for my salt soaks, Perfect for relaxing in the tub with! Mixed with essential oils and packaged! my customers love it! COMMENTS: Wonderful product for bath salts! COMMENTS: This is the perfect fine grain salt! COMMENTS: Combined with the epsom salts, offers a nice difference in texture. Skin feels great after using in bath salts. COMMENTS: I like to use about 20% of this in my salt scrubs, mixed with regular sea salt. More and it likes to absorb water and get bricklike. COMMENTS: I used just a bit of this in cold process soap for sensitive skin because of all it's beneficial properties. It behaved very well for me. However, I did only use a little, about 1 tsp per pound of oil, because I did not want to have weeping soap and so far no problems. I love the label appeal! 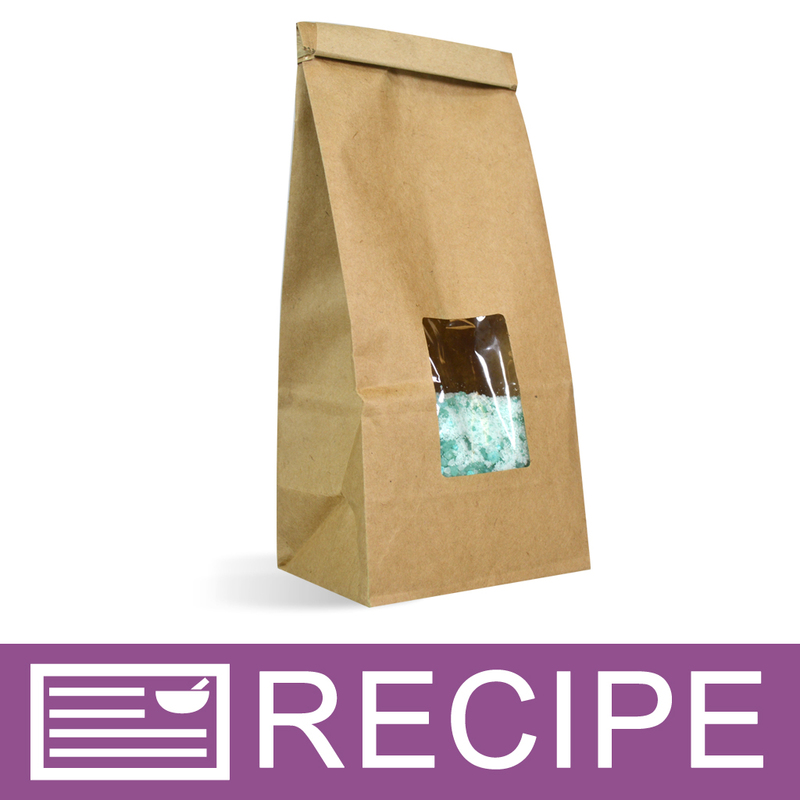 COMMENTS: Nice consistency for my Dead Sea Bath Salt mixes, hold scents. COMMENTS: These are a great value. Inexpensive and good quality. Use them for salt scrub and even added a little in cp salt bars without issue. Will purchase again. COMMENTS: The grain is slightly bigger than what I expected, but I was thinking table salt grain, which I guess would be extra fine. Works lovely in salt scrubs! COMMENTS: I purchased this for the coconut milk and lavender bath salt recipe. It turned out great and I love the texture of this salt. It melts well and I look forward to many more uses for it. I like the fact that it came from the Mediterranean. Good purchase. COMMENTS: I replaced my normal Epsom salt with more of an Epsom Salt/Dead Sea Salt blend. They are much nicer than just the normal epsom salt. I've also replaced most of my epsom salt use in other products with the dead sea salt. COMMENTS: I liked these the first time I used them. I love having control over the texture of the salt blend. Some customers want a small grain and others like the larger ones. These are particularly useful when making salt scrubs. Definitely a winner. COMMENTS: Perfect for our Bath Bombs and our Bath Salts. Love the fine grain as they dissolve faster. "Excellent quality and super price!" COMMENTS: I've made several batches of bath salts and fizzies with this salt and can't keep enough in stock. COMMENTS: These fine grain Dead Sea Salts are wonderful for a mildly exfoliating salt scrub. They aren't too abrasive that they scratch, but just enough to get rid of dead skin to leave you glowing! I use them in my shea butter salt scrubs and couldn't be happier with the end product. COMMENTS: Excellent in bath salt blends! COMMENTS: Great item for foot and bath soaks. And a good price too. Thanks for offering such great quality products. COMMENTS: Very pure - used in a couple of scrubs - easy to use! COMMENTS: Very nice quality, very fine grain salts. Dissolve easily in water. I prefer the look of the larger grain, so will probably order those next time. But this is a great product. COMMENTS: The fine grain works best in my body scrub. My clients love the minerals in my dead sea salt scrub. The course salt was too abrasive. Great product. COMMENTS: I love this dead sea salt as do my customers! Always what I expect! COMMENTS: This is my go-to salt for body scrubs. The grain size is perfect. COMMENTS: I mixed these with the medium bath water crystals. Absolutely perfect. "Zing Zing Went My Heart"
COMMENTS: This sea salt is worth it's weight in gold and is an excellent value. My favorite use for it is in a scrub that is also loaded with WSP's awesome shea butter. 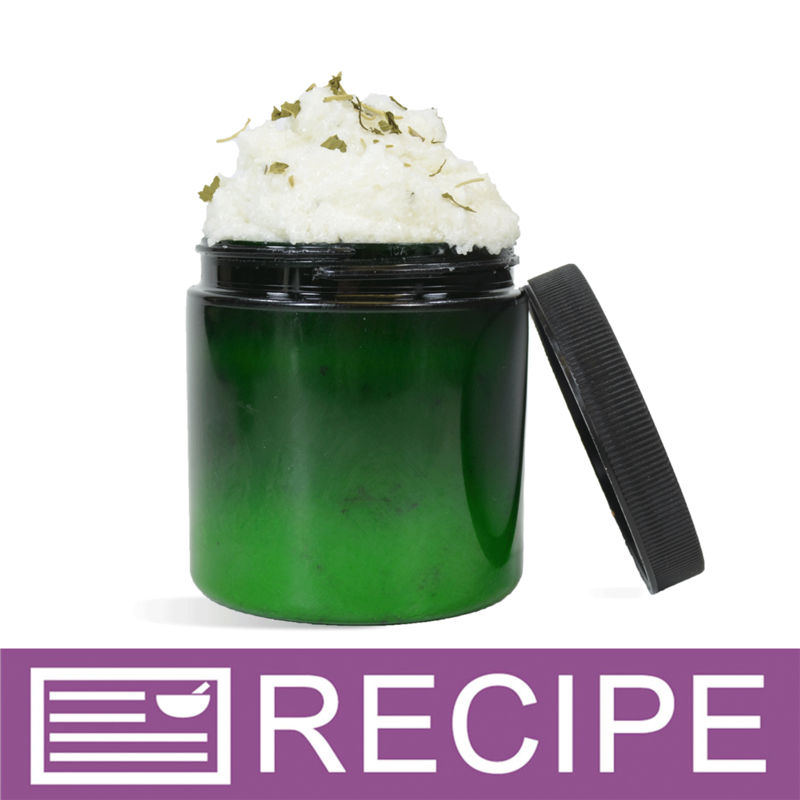 It makes the most delightful scrub and is fine enough that I, and many of my customers, can also use it on our face. I would not normally recommend anyone try a salt scrub on their face but this one is so fine and with the addition of the shea butter, that it works beautifully. I also use it in combination with my bath teas as we all know what a great job sea salt does at removing undesirable toxins. Hard to believe there was a time when I knew nothing about sea salt and certainly didn't use it for anything. Glad those days are behind me. COMMENTS: Used in my margarita cold process soap on top. COMMENTS: I am a huge comparison shopper and by far this is the most competitively priced and the quality is excellent. I highly recommend. COMMENTS: This is the best price out there for the quantity that you get. I have looked and purchased the same thing from other sites and spent way more. "Wonderful product at a great price!" COMMENTS: I love buying this in 2oz. increments. The salt is fine and dissolves well in the soap batter. Also, I don't have to weigh the bags. Instead, I dump however many I need into the mix. I've used this successfully with CP, HP, scrubs, and CPOP. I cannot think of anything I would change. Much easier than weighing out commercial sea salts and finer grain. COMMENTS: ThIs is a great salt. The benefits are amazing and the fine grain is a great size. I use this in bath salt and salt scrub. It hold fragrance well and is really good quality. COMMENTS: Excellent product exfoliates wonderfully. Would buy it again any time. COMMENTS: So far, so good. I mix 1/2 fine and 1/2 medium grain. Very happy with these salts. "Melts easily in your bath"
COMMENTS: What a wonderful way to add some luxury to your bath water! This size crystal easily dissolves under running water and doesn't sit at the bottom of your tub! "Great Dead Sea Salt "
COMMENTS: I've been using it in my body scrubs for 2 yrs. my customers love the Dead Sea salts. COMMENTS: Used this in my sea salt scrubs and it worked great. Product came out wonderful. I used the fine sea salt grain for a smoother scrub. I will continue to buy this for my recipe and the price was just right. I bought the 5 lb bag but will be buying a larger size as the scrubs are flying off the shelf. COMMENTS: I am loving this dead sea salt, i use them in body scrubs. My only complaint is when using them as a body scrub I find it hard to get this to bind when mixed with olive oil(I wonder what other ingredient i can use to bind it, instead of it rolling everywhere?). Other than that these scrubs are amazing and would 100& recommend them. COMMENTS: I love everything about this Dead Sea Salt. I have skin troubles and it has helped in minimizing the itching and redness. It takes oils well, dissolves completely, makes great scrubs. It's super. The only thing I would like to see is a middle sized container,like 8 or 10 pounds. COMMENTS: I too notice this has better scent throw, so we mix it with the coarse variety. It also makes a wonderful addtion to cold scrubs. COMMENTS: This is a great salt, I love the fine cut. Also mixes very, very well with epsom salt and course sea salt for variety and interest. Releases scent better than course salt seems to. COMMENTS: I used this salt in my body polish. Work Great!!! COMMENTS: These are great salts, and mix well with the coarse salts, too! "Can you use this in melt and pour soap for exfoliation?" Staff Answer Yes, this can be used in MP soap bars. "are these fine grain fine enough for facial scrubs?" Staff Answer This is a very fine grain salt so it would be fine for a facial product. "Is your Dead Sea Salt Kosher Certified? Thanks!" Staff Answer Our Dead Sea Salt is not Kosher Certified. "What is the grain size, roughly? I understand it's fine, but some fine grain is a lot smaller than some other... Do you have specs?" Staff Answer Hello - We have put in an inquiry to the manufacturer for that spec, as we do not have it. If we receive the spec, we will update you with it. Generally, the grains are larger than table salt, but slightly smaller than Epsom salt. "Can you use this in making cold process spa salt soap bars? I tried to make 2 separate batches using your salt, this salt in particular, but they do not lather, instead they are very sticky. Not a trace of lather whatsoever. I used other salts I bought from a different vendor and those actually lather. Why is that?" Staff Answer I am not aware of any reason that this product could not be used in CP soap. However, the fact that you had no lather when using the Dead Sea Salt but other salts seem to work just fine does raise some concern. You may want to take the question to a soap chat room or forum for more assistance. 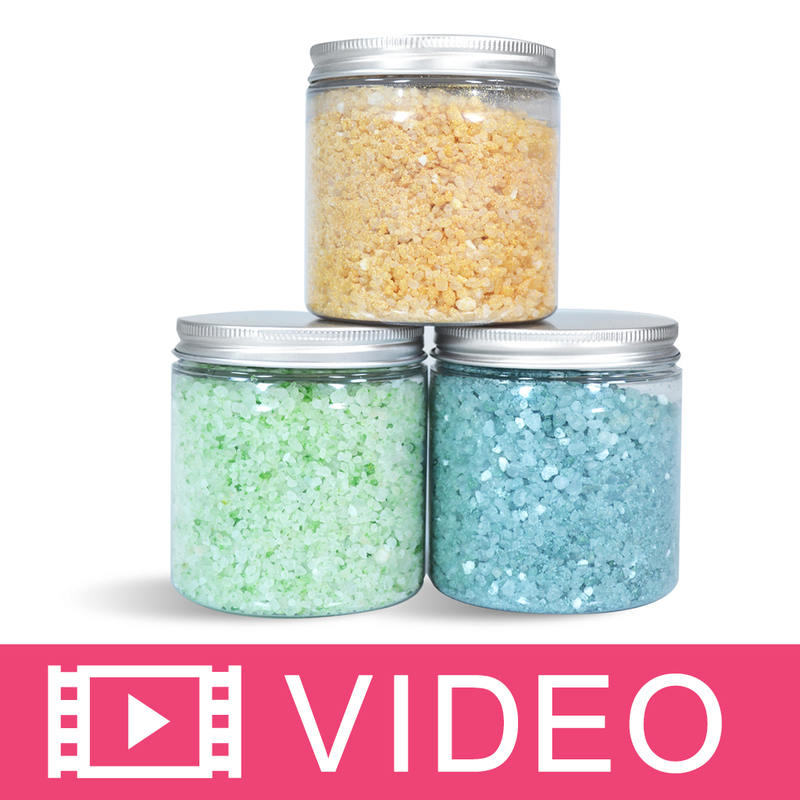 "What is the best colorant to use when coloring bath salts (Liquid or powder)?" Staff Answer Either type of colorant can be used, but some people prefer one type over the other. Keep in mind that liquids can sometimes cause smaller grain salts to clump while you are mixing. We prefer to use liquid over powder, but either will work with this product.